Fresh Pecans Now at Standley Feed! It’s our favorite season in Texas! Farm fresh pecans are headed toward your local Standley Feed & Seed Store. We offer them whole or shelled; you can get your own bag of pecans how you like them- and just in time for any special recipes you might be thinking about preparing this holiday season. 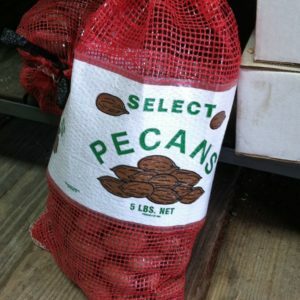 Pecans are also great to give for a thoughtful yet simple gift, and we have five pound bags ready for purchase. Texas pecans are always a good addition to a meal or snack. Stop in and pick up your pecans for a great deal at Standley Feed and Seed today! This entry was posted on Friday, September 28th, 2018 at 11:59 am	and is filed under News & Updates. You can follow any responses to this entry through the RSS 2.0 feed. Both comments and pings are currently closed.